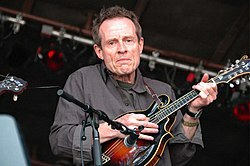 John Paul Jones (born John Baldwin on 3 January 1946), in Sidcup, Kent) is an English musician and record producer, and was known for being the bassist, the keyboardist and the mandolin player for rock band Led Zeppelin. During his time with The Shadows Jones was seen by Jimmy Page. When Jimmy was forming his new band, Jones' wife suggested he ask Jimmy about the new band. Jimmy was very glad that Jones had asked, and the two formed a duo. Soon after singer Robert Plant and drummer John Bonham joined them forming a Quartet. At first, the group was called The New Yardbirds, but the name was soon changed to Led Zeppelin. This page was last changed on 17 April 2019, at 01:13.